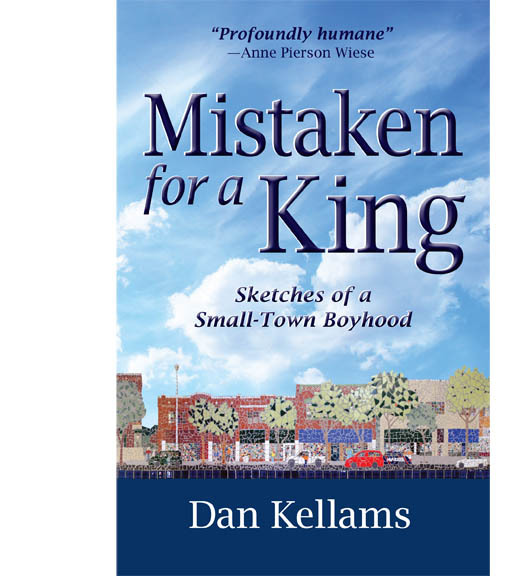 In “Mistaken for a King: Sketches of a Small-Town Boyhood,” Dan Kellams manages to not only avoid the same-old take on a small town childhood in his self-published tome; he uses his massive talent to build a set of subtle, lyrical essays that are beautiful, wise and full of heart. The small Iowa town of Marion should be justifiably proud of their native son and this shining book. Each chapter of “Mistaken for a King: Sketches of a Small-Town Boyhood” reproduces scenes from the author’s childhood in the middle of the 20th century in Marion. These vignettes are often startlingly vivid and frequently seem almost unfinished. As he states in the introduction, “A guy can’t remember everything, and the rules I set for myself in writing this book don’t allow me to make things up.” So much like the nature of memory itself, each passage is not a full story, but a glimpse into an era that has passed. It may be familiar to some, completely foreign to many, but regardless of your reference point, Kellams makes it seem real. Children in the 1940s, especially those in rural areas, had to find their own recreation (before television entered every home) and most of the tales told in the book revolve around such adventures. Kellams, his younger brother and his friends roamed the town, making their own amusements, getting into petty trouble and learning to grow up. With a freedom many would find shocking today, the boys could be found in alleyways, in the fields playing ball, on rooftops, exploring and living and learning in ways children today would never be allowed to do. In sometimes intensely personal stories, the author describes growing up as a sensitive, shy boy in a town full of characters. The stoic, supportive and industrious parents who devoted their lives to their sons; the rough and tumble schoolmates with surprising depths; his beloved pets; his heroes and bullies; the local popcorn seller; the teachers who shaped him; family, friends and so many others. Several chapters discuss his parents in stark detail, such as using their first names rather than “Mom” and “Dad.” The memories are nevertheless told with obvious reverence, respect and love. Like many who grew up in the Great Depression, his parents were frugal and hard-working, but Kellams makes it clear with his beautiful prose just how loved he and his brother were, even though they never said it aloud. In a short epilogue, the author sums up many of the stories he began throughout the book, but none is more powerful than that of his parents. In simple terms, he reviews the end of their lives with a grace and humanity that is almost musical. The unadorned language the author uses to describe the people and moments throughout the book make each moment powerfully clear and often they deeply resonate with the reader. Honest, unflinching and terrifically human, this is a masterwork of a memoir. It is a truly artful collection of stories and is very much worth the read, whether you grew up in a small town or not. Mistaken for a King evokes the life of a small-town boy in the middle of the last century. The book distills the essence of childhood in a series of finely honed and often funny essays, recounting memorable events and adventures that occurred between the ages of five and twelve. Kids roamed free as sparrows in Marion, Iowa, during the 1940s. Untouched by television, they created their own amusement wherever they found it, in backyards, side streets, alleys, and pastures. Some readers will be transported to their own childhoods; others will be charmed by the recollections of young lives lived so spontaneously. Many will ponder what has been lost. I remember three boys sitting in a row on the roof of a garage, their knees pulled up under their chins, their arms wrapped around their legs. They aren’t supposed to be up there. I am one of the boys. My best friend, Tom, is another. I’m not sure who the other is. I’m pretty sure it’s not my younger brother, Pete.